Uplift Comics is the home of The Baby Isaac Crew. The Baby Isaac Crew is a “Live Action” mascot performing group that performs original shows at schools, churches, community events and private parties. With easy-to-love characters, The Baby Isaac Crew brings smiles to the faces of young and old alike. The Baby Isaac Crew focuses their productions on messages that uplift and inspire children to be their best with songs like Be a Buddy-Not a bully, I Feel Great, Kid’s Use Your Mind, and many more. Everywhere they go, children are learning valuable lessons and falling in love with Baby Isaac Crew at the same time. Uplift Comics and The Baby Isaac Crew have built quite a following and continue to expand operations across the country, via online and on broadcast television. With programs designed especially for school age children. The Baby Isaac Crew’s goal is to impact young lives in a positive and fulfilling way. 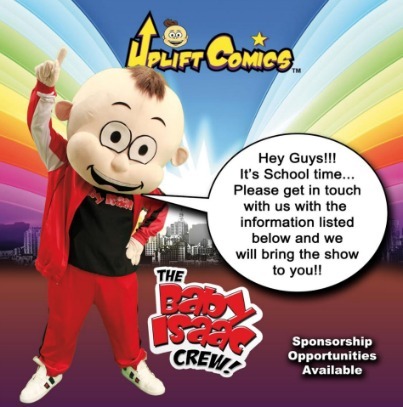 Current opportunities and projects presented to Uplift Comics include pilots for television, toys, and books based on The Baby Isaac Crew Characters. Effort and time is dedicated to remaining current and relevant with the changing times and always maintaining a message that positive and uplifting.